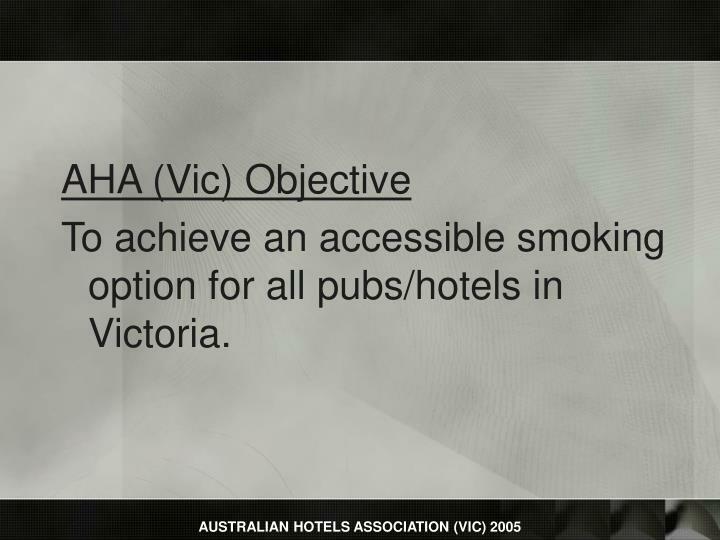 AHA (Vic) Objective To achieve an accessible smoking option for all pubs/hotels in Victoria. 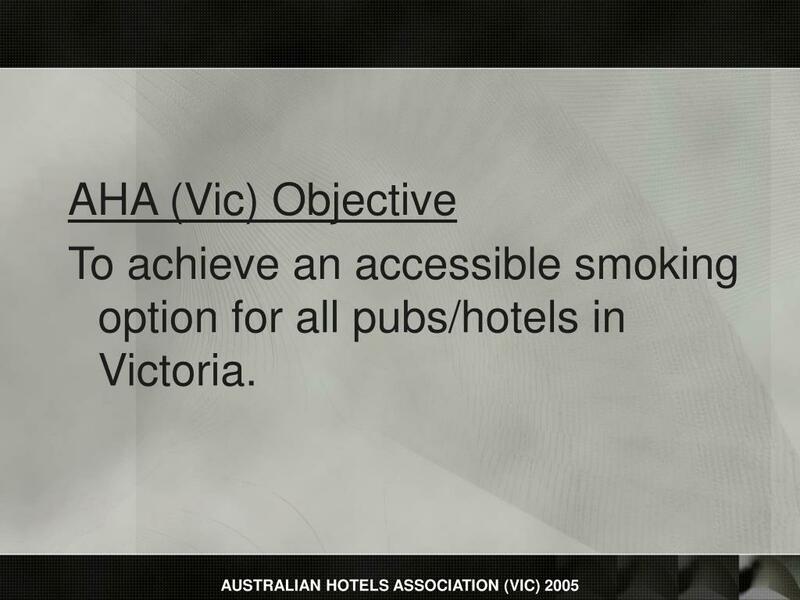 AHA (Vic) Objective To achieve an accessible smoking option for all pubs/hotels in Victoria. 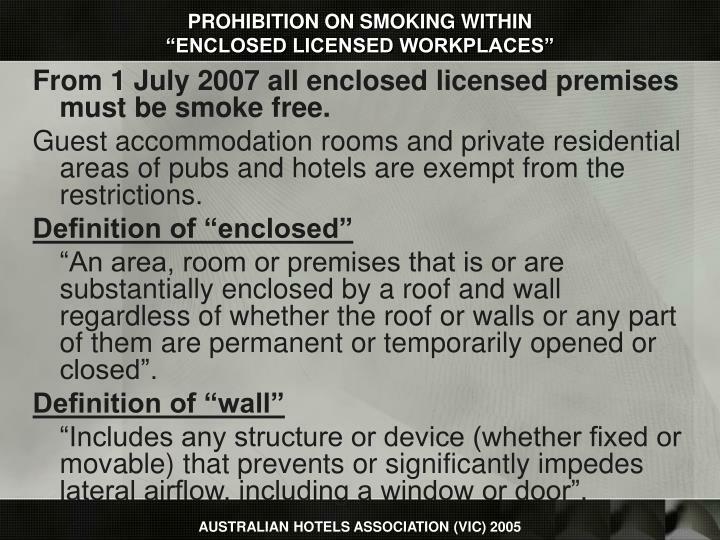 PROHIBITION ON SMOKING WITHIN “ENCLOSED LICENSED WORKPLACES” From 1 July 2007 all enclosed licensed premises must be smoke free. 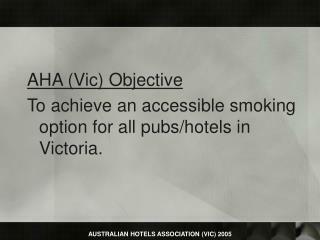 To achieve an accessible smoking option for all pubs/hotels in Victoria. 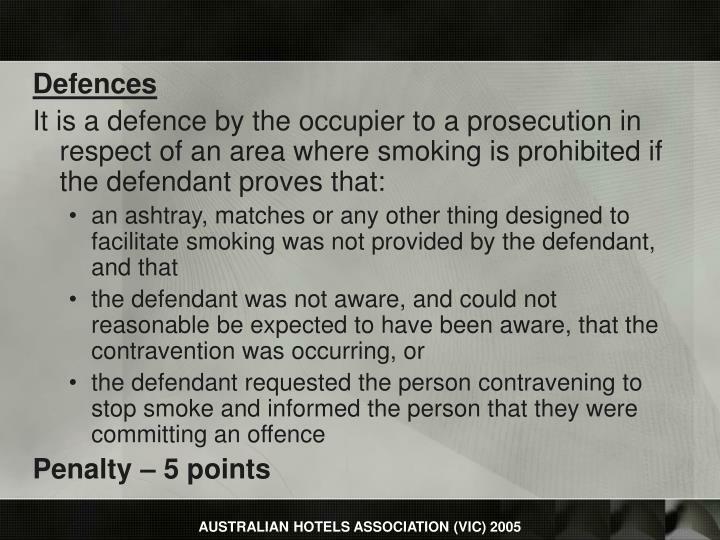 From 1 July 2007 all enclosed licensed premises must be smoke free. Guest accommodation rooms and private residential areas of pubs and hotels are exempt from the restrictions. “An area, room or premises that is or are substantially enclosed by a roof and wall regardless of whether the roof or walls or any part of them are permanent or temporarily opened or closed”. “Includes any structure or device (whether fixed or movable) that prevents or significantly impedes lateral airflow, including a window or door”. the total actual area of the wall surfaces exceeds 75% of the total notional wall area. An addition to the property providing for an open deck/floor/space with no roof/cover and open-sides. The open top and open sides are not over built/enclosed by existing and/or adjacent buildings, awnings or roofs and the sides are not enclosed by adjacent buildings or fences/walls. 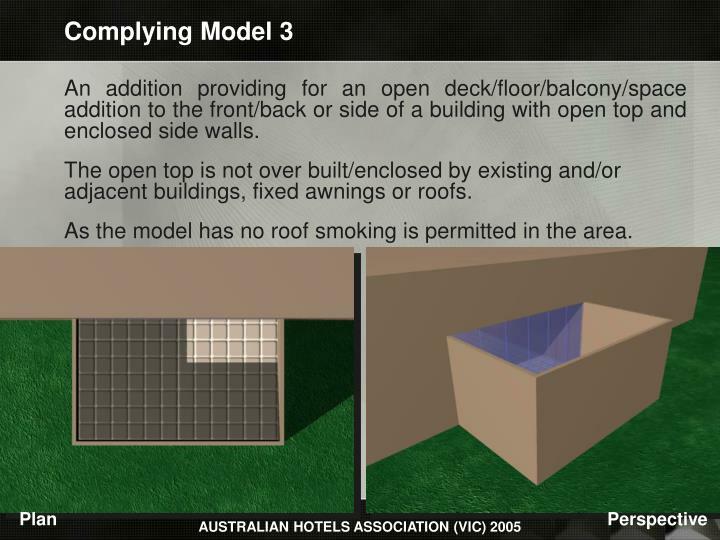 As the model has no roof smoking is permitted in the area. An addition providing for deck/floor/space with no roof/cover and one open wall. 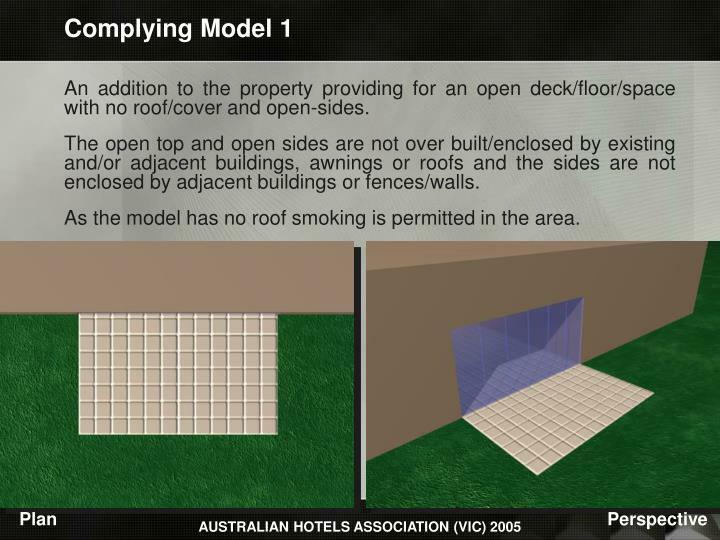 The open top is not over built/enclosed by existing and/or adjacent buildings, fixed awnings or roofs. The open side is not enclosed by adjacent buildings or fences/walls. An addition providing for an open deck/floor/balcony/space addition to the front/back or side of a building with open top and enclosed side walls. The open top is not over built/enclosed by existing and/or adjacentbuildings, fixed awnings or roofs. 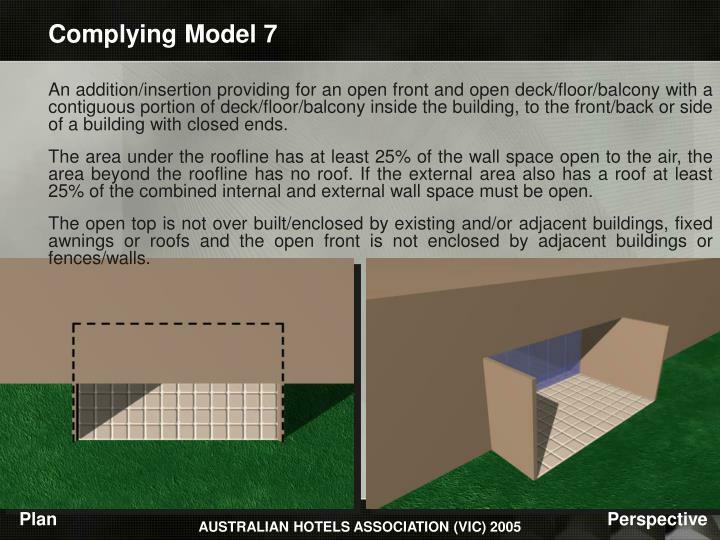 An addition providing for an open front verandah/roof addition to the front/back or side of a building with open ends. The open front and sides are not enclosed by adjacent buildings or fences/walls. 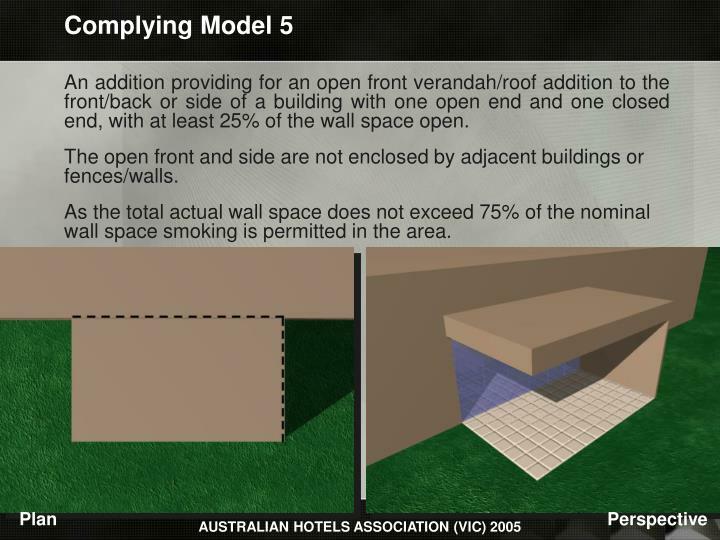 As the total actual wall space does not exceed 75% of the nominal wall space smoking is permitted in the area. 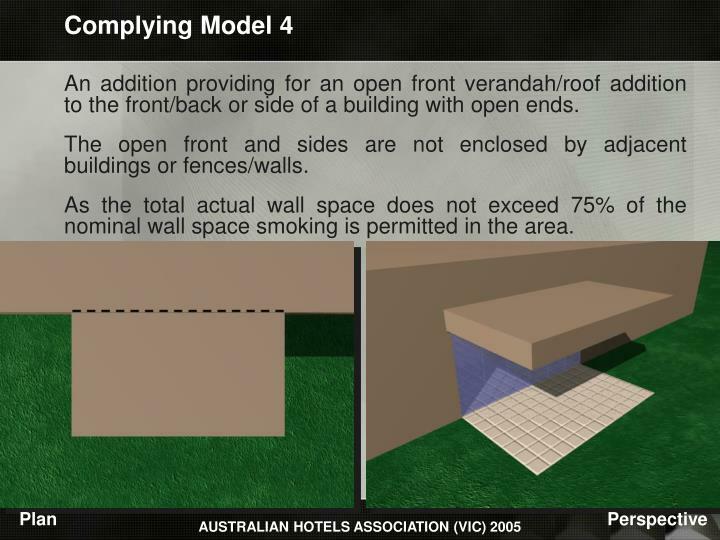 An addition providing for an open front verandah/roof addition to the front/back or side of a building with one open end and one closed end, with at least 25% of the wall space open. The open front and side are not enclosed by adjacent buildings or fences/walls. 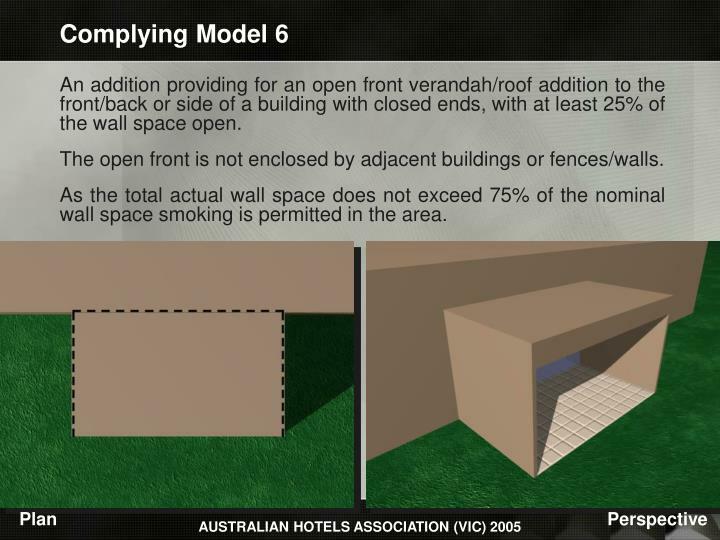 An addition providing for anopen front verandah/roof addition to the front/back or side of a building with closed ends, with at least 25% of the wall space open. The open front is not enclosed by adjacent buildings or fences/walls. An addition/insertion providing for an open front and open deck/floor/balcony with a contiguous portion of deck/floor/balcony inside the building, to the front/back or side of a building with closed ends. The area under the roofline has at least 25% of the wall space open to the air, the area beyond the roofline has no roof. If the external area also has a roof at least 25% of the combined internal and external wall space must be open. The open top is not over built/enclosed by existing and/or adjacent buildings, fixed awnings or roofs and the open front is not enclosed by adjacent buildings or fences/walls. 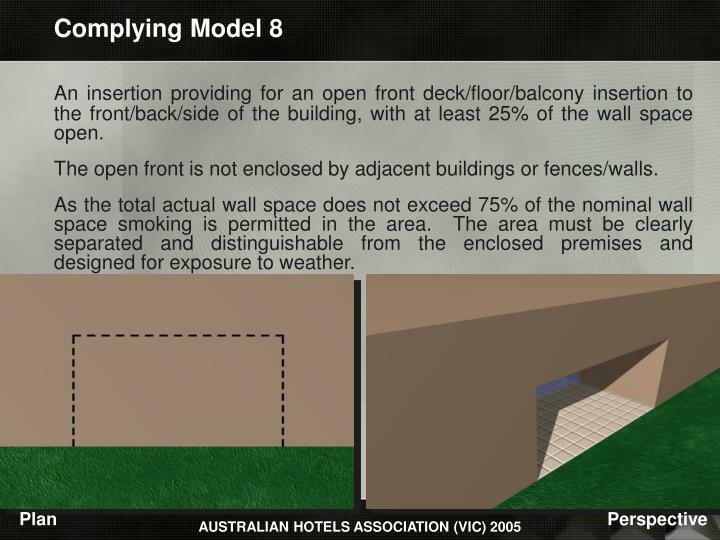 An insertion providing for an open front deck/floor/balcony insertion to the front/back/side of the building, with at least 25% of the wall space open. 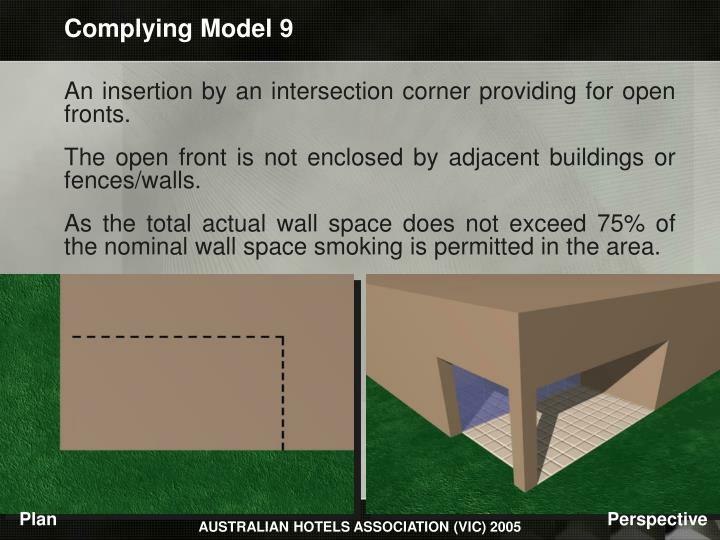 As the total actual wall space does not exceed 75% of the nominal wall space smoking is permitted in the area. 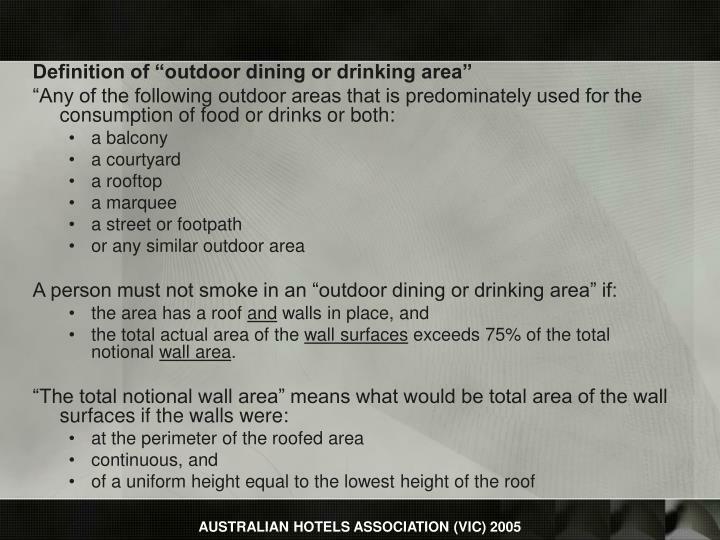 The area must be clearly separated and distinguishable from the enclosed premises and designed for exposure to weather. An insertion by an intersection corner providing for open fronts. An insertion providing for an internal courtyard / beer garden / deck / floor. 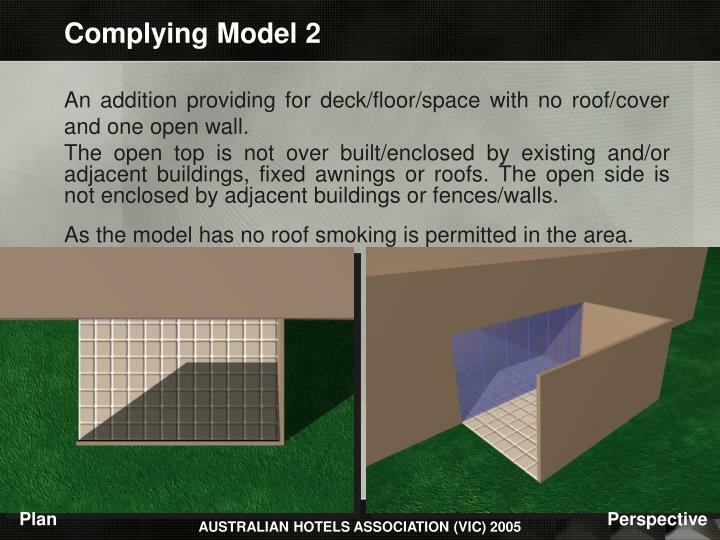 The open top is not over built/enclosed by existing and/or adjacent buildings, fixed awnings or roofs. 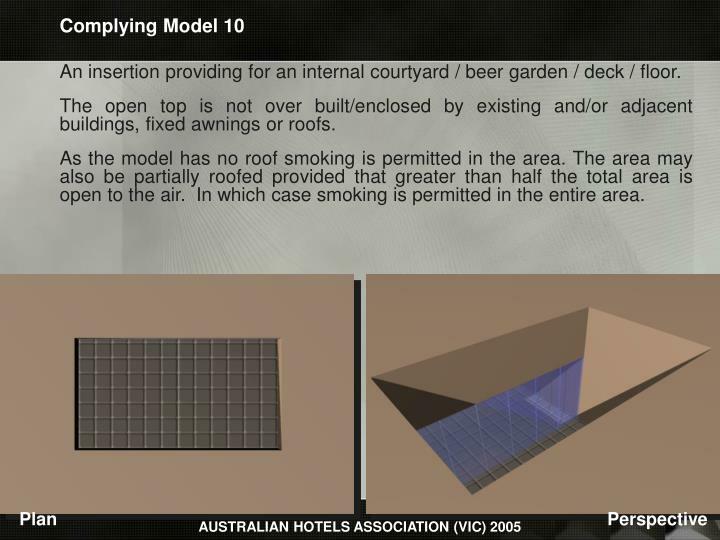 As the model has no roof smoking is permitted in the area. The area may also be partially roofed provided that greater than half the total area is open to the air. In which case smoking is permitted in the entire area.